FREE – PUBLIC WELCOME 1:00 – 3:00 p.m. DONATIONS TO THE HOLLYWOOD HISTORICAL SOCIETY ACCEPTED! New Book. I haven’t kept up with the blog for a few months because I’ve just brought out another book. This one isn’t about Hollywood and it isn’t non-fiction. It’s a murder mystery, written under my pen name MICHAL SHERRING. The book is called Done for at the Danford. An Art Museum Mystery. The amateur sleuth is the Curator, Robin Grinling. You can also find the book on Amazon under Michal Sherring, or under the book’s title, and read the reviews. And if you read my museum mystery and like it,please write a review on my Amazon page! I will be there, wearing two hats. On March 12, Tuesday, I’ll be there from about 1:00 to 4:00. With me will be members of the Hollywood Historical Society who will sell copies of my biography of Hollywood’s Founder, Joseph W. Young, Jr. for the Historical Society. On March 14, Thursday, I will be taking part in a Writer’s Forum from 12:00 to 3:00 p.m., and will briefly discuss both books. HERE’S THE LINK TO THE WEBSITE !! according to reports, was $71.00 per acre. February 19, 1921 the name “Hollywood” appears, in the Miami Metropolis Herald, announcing that Joe Young had incorporated the Hollywood Land & Water Company with $1 million capital. So I am going to discuss the naming of Hollywood, Florida today. Why “Hollywood”? Why did Joseph Young name his planned city “Hollywood.” The direct answer, as best as my research has found, is that he just liked the name. According to Edythe Whitson, who was working for Young in Indianapolis before he even began looking for his city site, when he told his staff that he had bought land and was planning a city called “Hollywood, Florida,” they wondered why that name. Well, for one thing, he didn’t want anything named for himself, no Youngstown, or Youngville. As far as Mrs.Whitson and the others could figure, Young just liked the sound of the name Hollywood. It isn’t an unusual name for a place. There are some 18 Hollywoods in the USA, some dating from the 19th century. For example, Hollywood, Maryland was named in 1867 for a holly tree, according to their website. The point here is that Hollywood, California, wasn’t unique when Young named his city. Maybe there were holly bushes here? No, holly doesn’t grow in our part of Florida. 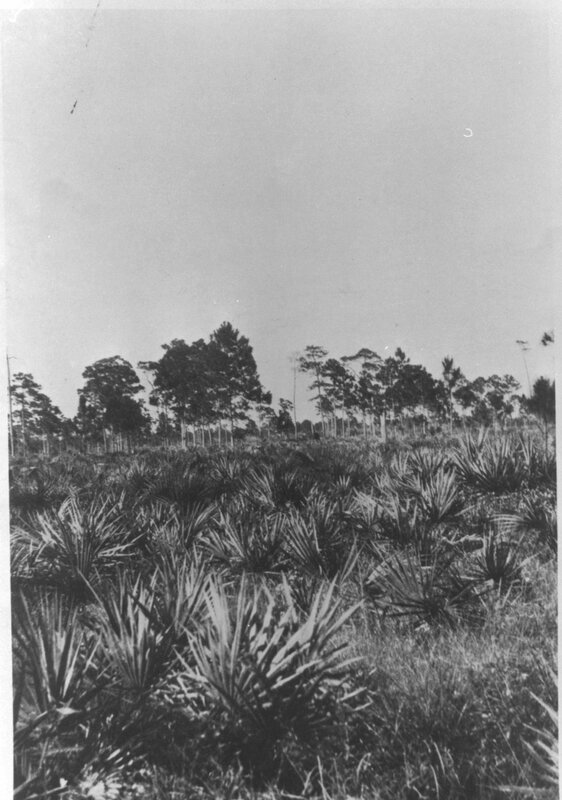 Young’s land would have been covered with palmetto, sandspurs, reeds in the marshy places, some planted fields of tomatoes and pineapples, and in the dry areas, the jackpines. right, Tony Mickelson standing where Hollywood Boulevard would be built as a turning off the Dixie Highway, dated May 1, 1921. Collection of the Estate of Tony Mickelson. 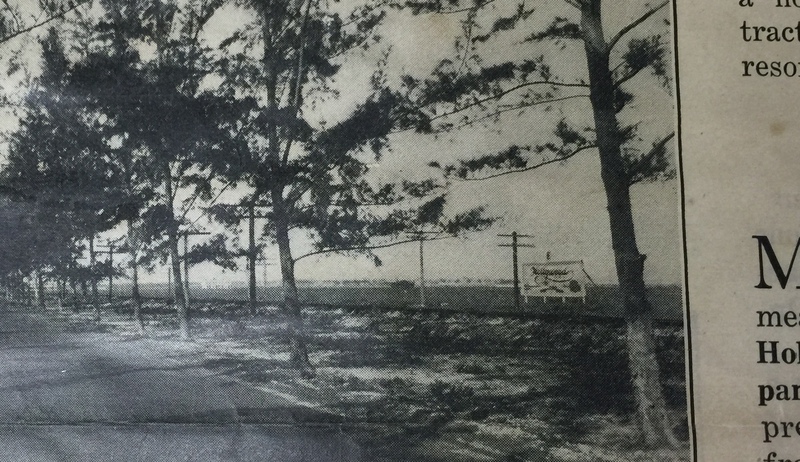 The Miami Woman’s Club had planted casuarina trees along the Florida East Coast Railway tracks when the area was still Dade County. left, from Young’s Hollywood Reporter, 1922. The sign reads “Hollywood By-the-Sea.” Caption says looking north up the Dixie Highway, with the Florida East Coast railroad just to the right. Well before 1920 someone had started groves of avocados and mangos along today’s 24th Avenue. We had some of the avocado trees on our acre of land on Polk Street (24th doesn’t go through there). I can still spot some of these 100-year-old trees beside older homes in the Little Ranches. 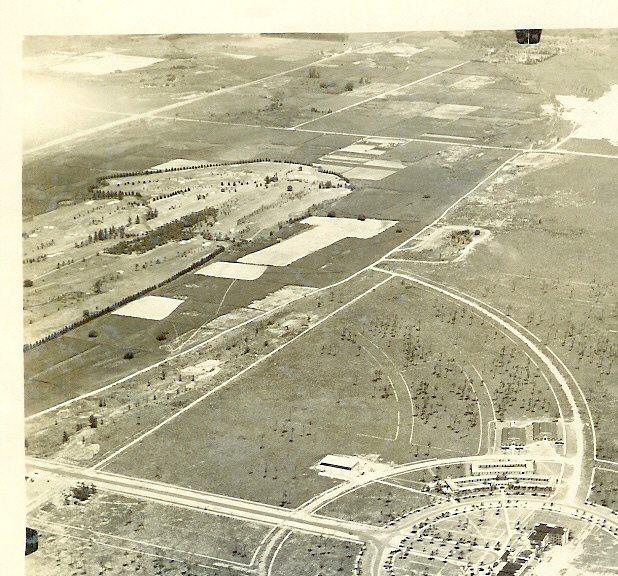 And there was also the orange grove planted on today’s Orange Brook Golf Course, which was still there in the 1930s. But no holly. right, Orange Brook Golf Course in the 1930s. Postcard. About Hollywood, California. The most common assumption is that J. W. Young was movie-crazy, and therefore named his city for the movie capital. There are many incorrect elements in that assumption. For starters, I’ll just point out that Young named his city in 1920. At that time, Hollywood CA was still a 120-acre community, part of the city of Los Angeles (which it still is), in the flat land beneath a range of mountains. It had been purchased in 1883 by Horace and Daeida Wilcox, from Topeka, Kansas, to create a “utopian-like community containing citizens who reflected the Wilcoxes’ own Christian values,” allowing no bars or saloons in their land. (If you want the source of all my info, please refer to my biography of J. W. Young which is thoroughly referenced and annotated.) Interestingly, Young did have similar values to the Wilcoxes, not in so many words, but his city was planned to be a beautiful place for everyone. As for bars, this was a moot issue since Prohibition was in force in 1920. Ah, but where in Chicago was this wealthy woman’s holly-bearing property? In a sense it’s hidden in plain sight. Poking around on the Internet for an Illinois Hollywood, I found it, right in Cook County. When Edith Rockefeller married Harold McCormick in 1893, her father John D. Rockefeller gave her a tract of land that she named Hollywood for its lush holly bushes. In 1919 Mrs. McCormick sold some of her property to the Hollywood Citizens Association, then donated much of the rest of it to the Forest Preserve of Cook County for a zoo. So the genealogy of Hollywood, Florida’s name goes like this: Edith Rockefeller McCormick names her Illinois estate “Hollywood.” Daeida Wilcox meets Edith on a train, likes the story and takes the name back to her property in California, even though there are no hollies on her land. Her development is well-advertised in the Los Angeles area, as “Beautiful Hollywood,” by 1903, and was one of the destination names on the trolleys that ran all over Los Angeles and Orange counties. J.W. Young, having heard the name from the papers, perhaps, like Daeida Wilcox, simply liked the sound of it. You can read about Long Beach as a center of silent film-making in Jura & Bardin, Balboa Films: A History and Filmography of the Silent Film Studio. No movie theaters in Young’s Hollywood. And another thing. If Young had been so enamoured of movies, silent or otherwise, then wouldn’t he have built one of those 1920s movie palaces that are so admired today? He had the resources. But in fact, Young never built any kind of theaters at all. 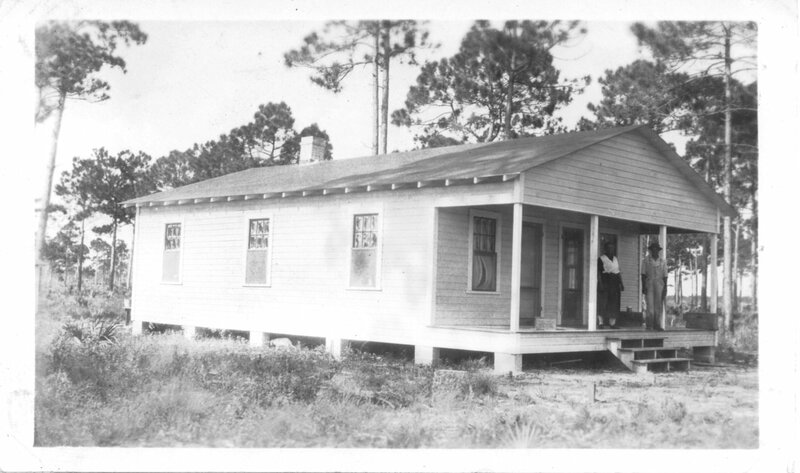 He gave land for congregations to build churches, and he built a school. But no theaters. 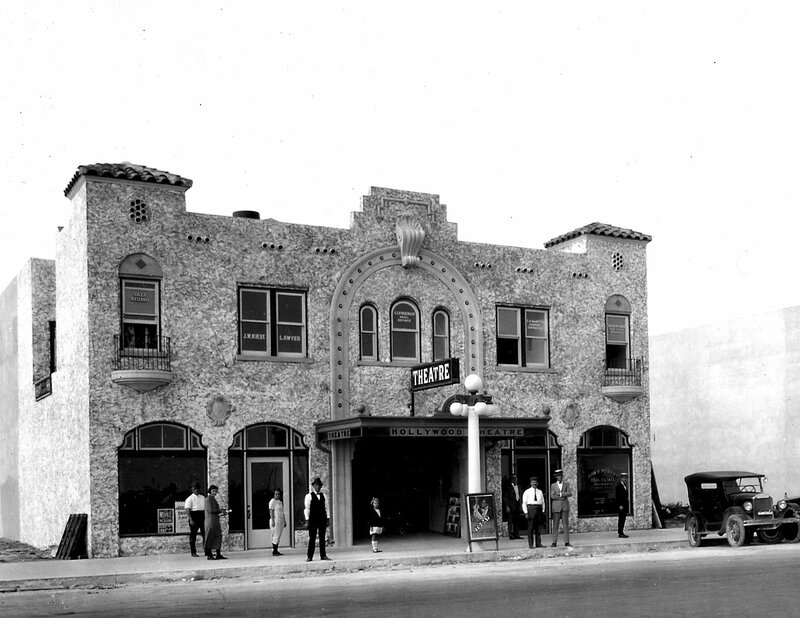 Yes, there was a theater in downtown Hollywood, built in 1923 but it was built by someone else,Thomas McCarrell, Sr., for stage performances. It was called the Hollywood Theatre. Arthur Enos was first stage manager. Movie films were added years later and the name was changed to Ritz Theatre. And up along 18th Avenue (now U.S. 1) on land not owned by J. W. Young, was Brandon’s Hippodrome Theatre, while nearby was the Garfield Theatre, again, not built by Young. 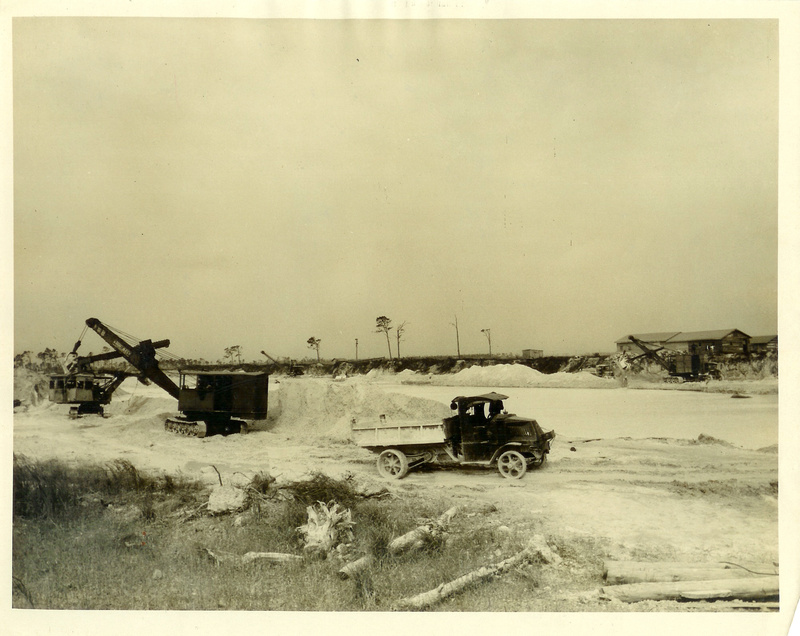 At right is Brandon’s Hippodrome after the 1926 hurricane which demolished many buildings along north 18th Avenue (US 1). Perhaps they were not built according to the building code enforced by Young on his land. Brandon’s establishment was chiefly for vaudeville, possibly not the kind of entertainment Young envisioned for his family-oriented city. We haven’t located any information about the Garfield Theatre. How Young entertained visitors. J. W. Young was by no means opposed to public entertainment. 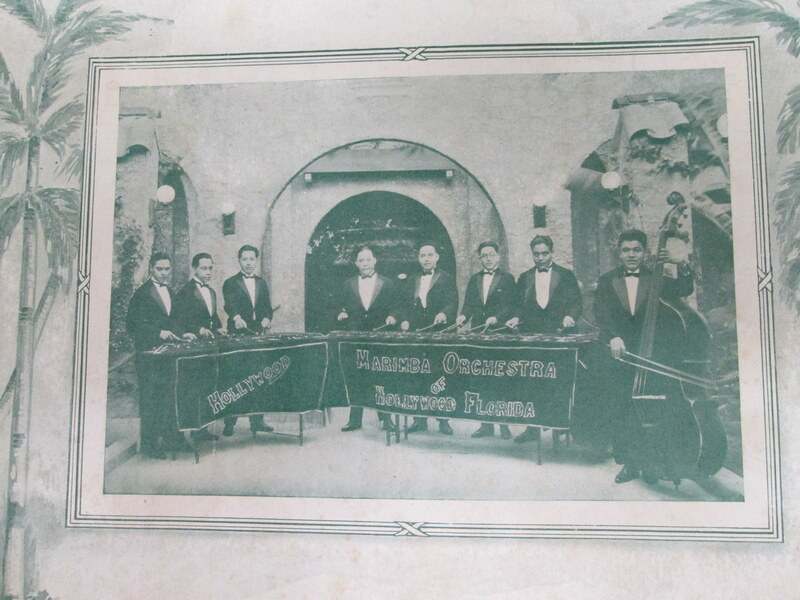 As soon as his first hotel was built, in otherwise empty Hollywood, he put a marimba band on the payroll of the Hollywood Land & Water Company, and had them playing in the lobby of the Hollywood Hotel. As soon as he was able to bring roads over to the beach island, he built the Tangerine Tea Room for dancing on the Broadwalk. Below, the Broadwalk looking north, the Tangerine Tea Room on the corner of Johnson Street, 1925. 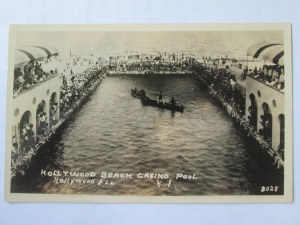 Also on the Broadwalk at Johnson Street, south side, Young put in the Olympic size salt-water pool, called a casino before that term became connected with gambling, and brought noted swimmers, divers, and other water entertainment for viewers to watch from covered grandstands. Top, Hollywood Beach Casino Pool with viewing stands filled to capacity watching some sort of small boat activity. Bottom, Young’s Hollywood Casino, 1925. Hand-colored postcard. 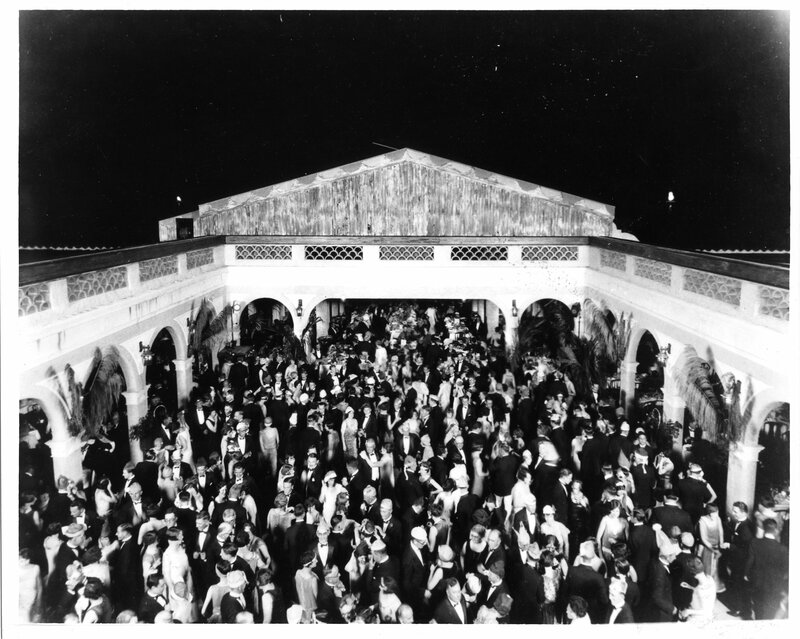 Young’s Country Club, seen at right, was designed with an elegant glass dance floor that was open to the stars above, with colored lights in the glass floor beneath, and a full orchestra playing during dinner and dancing. At right, dance floor with canvas roof open. Hand-colored postcard. At left, the dance floor, looking in the opposite direction, filled with elegantly-dressed dancing couples. As for movie production, Young was well-acquainted with sound stages, having seen several in operation in Long Beach, and surely would have found room for them in Hollywood if he’d been interested in film-making. There were sound stages in Miami, as well. 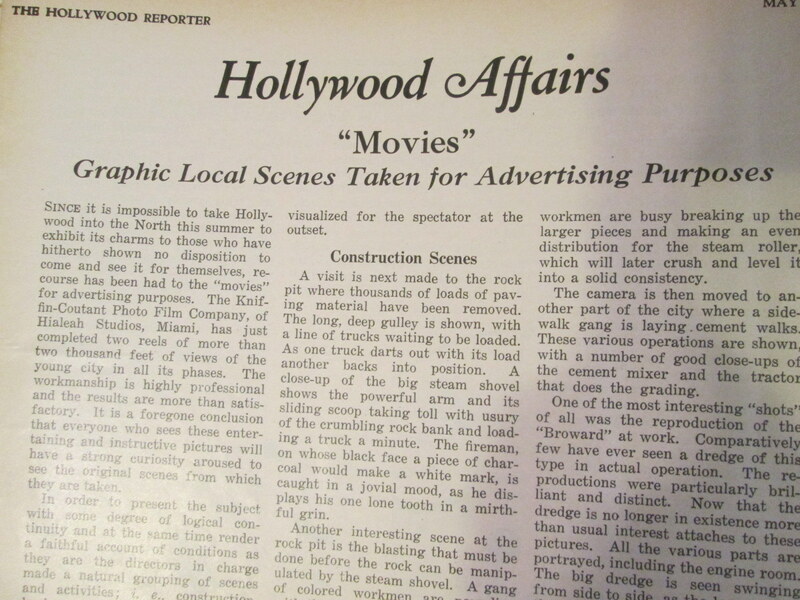 But there is no record of any regular movie production activity in Hollywood in the 1920s, not in the city or county directories, not in Young’s news Reporter or in plans by his architects, and not on the Sanborn map of 1926 which indicates every structure in the city including garages and sheds. The article, headed “Movies. Graphic Local Scenes Taken for Advertising Purposes,” stated that two reels of films about the making of the city had been commissioned from the Kniffin-Coutant Photo Film Company of Hialeah Studios, Miami, to show Hollywood “in all its phases.” By this means Young was certain that “everyone who sees these entertaining and instructive pictures will have a strong curiosity aroused to see the original scenes…” and surely, buy the properties. So, to sum up, Joseph Young, founder of Hollywood, Florida in 1920-21, had spent his own 20s and 30s in the center of silent film-making in California, that is, Long Beach, where the main studio was called Balboa. The small suburb of Hollywood, part of Los Angeles, was miles away, chiefly accessible by trolley from where Young lived. Nothing suggests that Young traveled to see the Wilcoxes development, but he could have read about Beautiful Hollywood in the Los Angeles papers. Mrs. Wilcox, founder of that Hollywood with her husband, chose the name because she liked it, even though there weren’t any hollies on her land. There were no hollies on Young’s Florida land, either, but he too, seems to have liked the name, but wasn’t particularly interested in film entertainment. He did not build a movie palace in Hollywood, nor did he build sound stages. 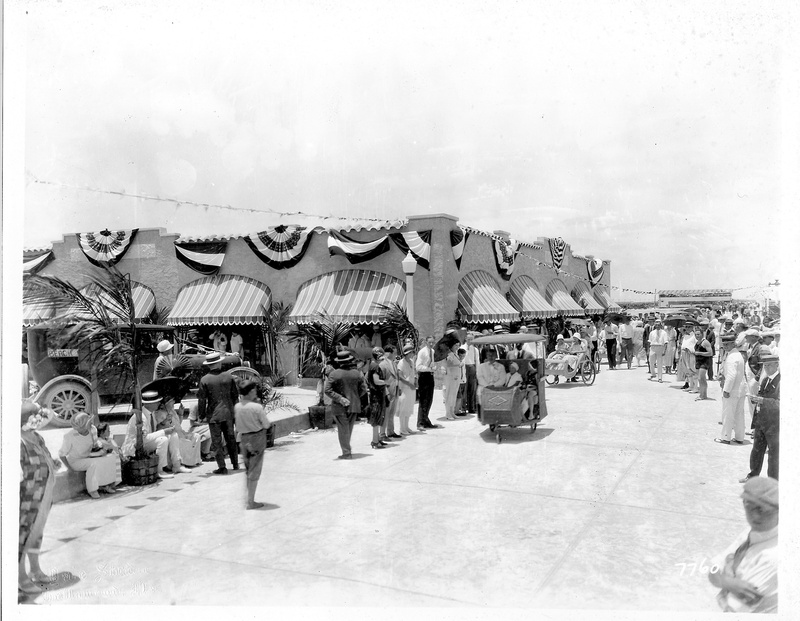 His main connection to film-making was in 1924 when he hired a Hialeah film company to make a documentary of the building of his city, in order to attract more visitors–and buyers–to his Hollywood. Three photos of the movie photographer documenting early Hollywood. Left, on the Broadwalk covering a baby parade. Building at center is a sales pavilion. The pink cement Broadwalk is lined north from Johnson Street with handsome street lights. 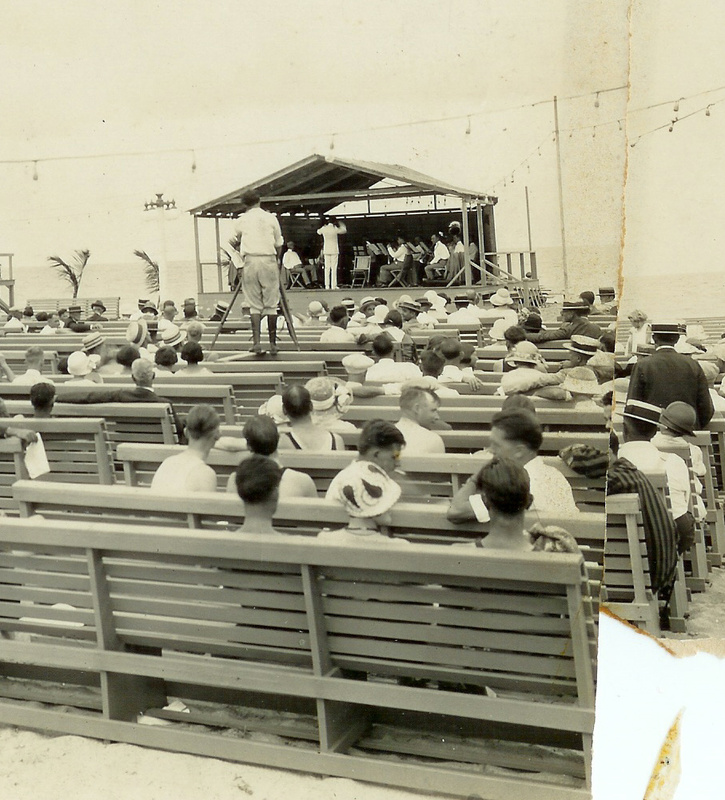 At right, probably the first of several bandstands at the ocean end of Johnson Street. Photog at center while the band leader in his white suit may well be Caesar LaMonaca. All are courtesy of the Hollywood Historical Society. At right, the cameraman is aiming at the Hollywood/Park View Hotel across Circle Park (now Young Circle), with the Great Southern Hotel at right, while several marching bands proceed toward the viewer. So now you know about J. W. Young, movies, and naming Hollywood. Pass the word along! As the fate of this portion of Hollywood’s history is now under consideration, I am offering this quick summary of its early history for those interested. Before Hollywood. This parcel was planted with an orange grove some time before 1920. To the west of it was nearly the Everglades, while south and east, from about today’s 28th to 31st Avenues, was the West Marsh. Young acquires the land. City founder Joseph W. Young bought this parcel in 1925 from G. M. Stratton, in order to expand the area Young called Hollywood Hills. 3rd circle, just laid out. Left, aerial view of the third circle, now Presidential Circle. The grid of streets, at top, end at today’s 28th Avenue. The undeveloped area at center right would include the Stratton property. Photo by Clyde Elliott, 1924. I don’t know much about Mr. Stratton, except that he was probably one of the salesmen for Hollywood Land & Water Company. He built a beautiful home at 858 Harrison Street in 1925 (it was on the Hollywood Historical Society’s Home Tour in 2004). 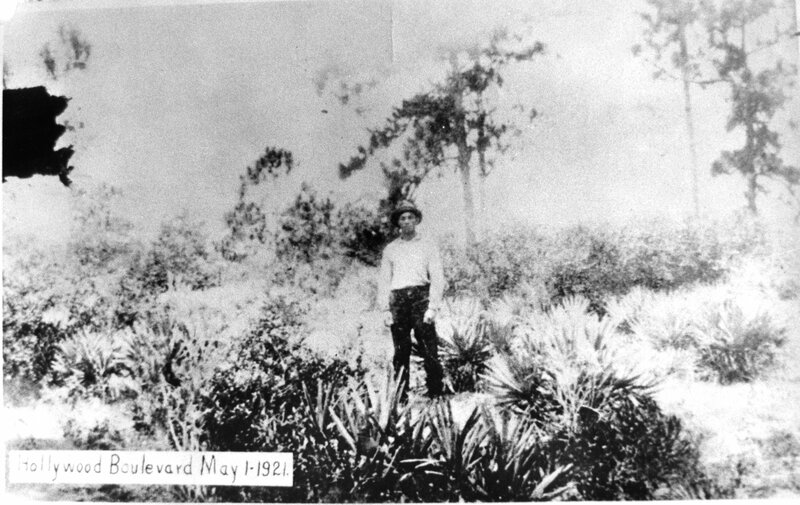 The orange grove was still on the land in 1925. I have read somewhere about a photo of Young up on a ladder in a tree, picking “his” oranges. 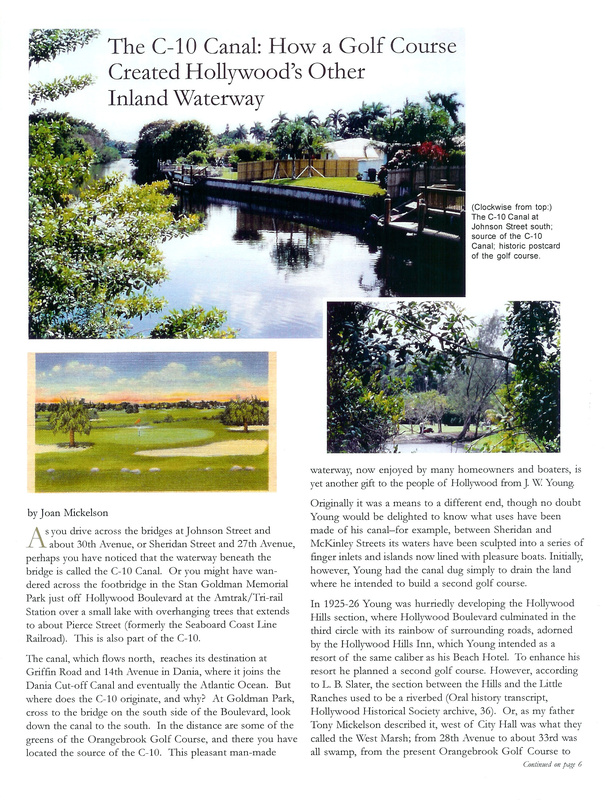 Young called on his friend Ralph Young to plan a second golf course there, Ralph having overseen the creation of the Hollywood Golf & Country Club course. At right, photo of Ralph Young, about 1925. At the same time, J. W. Young had his engineers create a channel for water from the spring that emerges from that property, in order to partly dry out the West Marsh, on the south side of Hollywood Boulevard. Young’s canal eventually became today’s C-10 canal. I wrote about this in the Hollywood Historical Society’s newsletter back in 2004. At left, page from Hollywood Historical Society newsletter of 1st Quarter 2004 with my article. Small photo at right shows where the spring rises just south of Hollywood Boulevard, in the Orange Brook Golf Course. Young did not complete that golf course, and by the end of the 1920s the property had changed hands. As the Hills area wasn’t developed before the late 1950s, the golf course became completely overgrown. 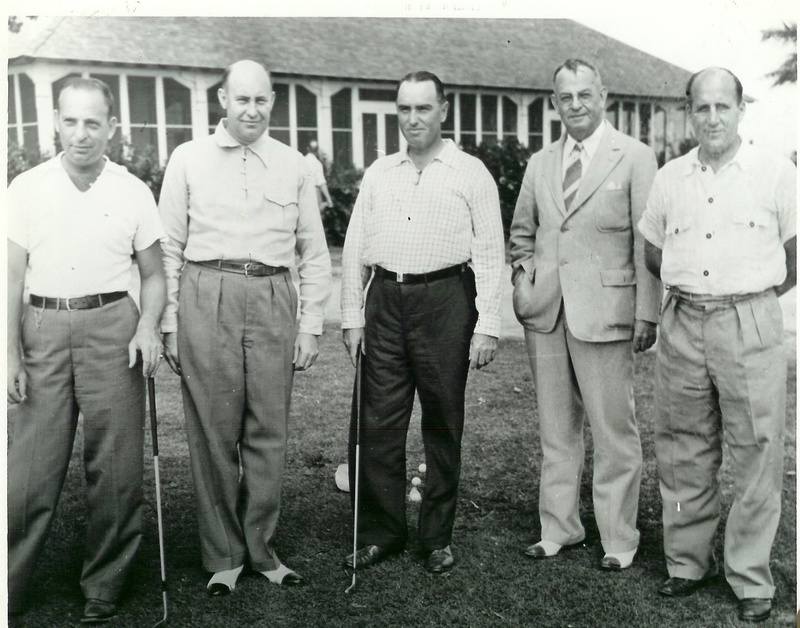 Local men raise funds to create the municipal golf course, 1934-37. In the 1930s Hollywood was a very small, impoverished city that relied heavily on the tourism industry. 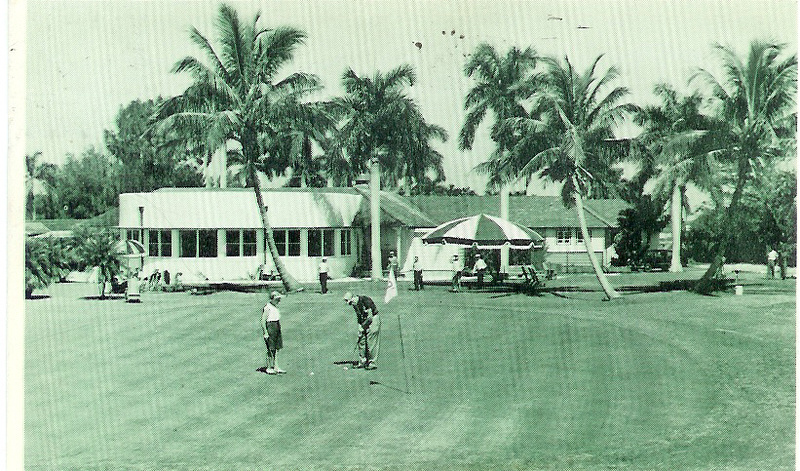 The original Golf & Country Club, downtown, had been sold to the owners of the Hollywood Beach Hotel, so there was no public golf course for locals and general visitors. 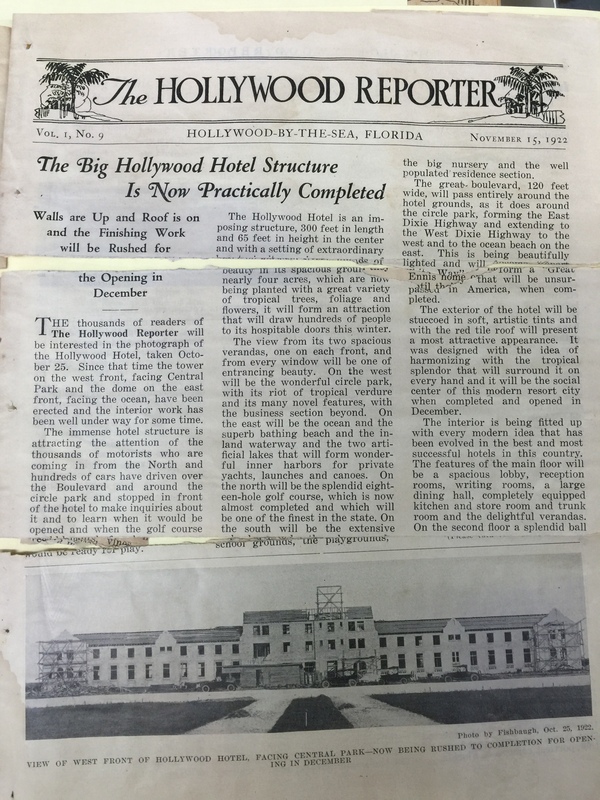 Both Virginia TenEick in her History of Hollywood, and the Hollywood Herald of the 1930s describe the enormous effort put in by several Hollywood pioneers/residents to create this opportunity for Hollywood. As the city had no money and the nation was deep in the Depression, the members of a municipal golf board planned the work involved and raised funds to carry it out. They were R.B. Tilly Walker (real estate), Don D. Freeman, C. R. Gilliland, and Floyd L. Wray (owner of Flamingo Groves). Dr. Arthur W. Kellner, then a city commissioner was the city’s representative to the board (a dentist, he was later mayor as well). Floyd and Jane Wray had a beautiful 1920s home in Hollywood at 1615 Monroe Street. 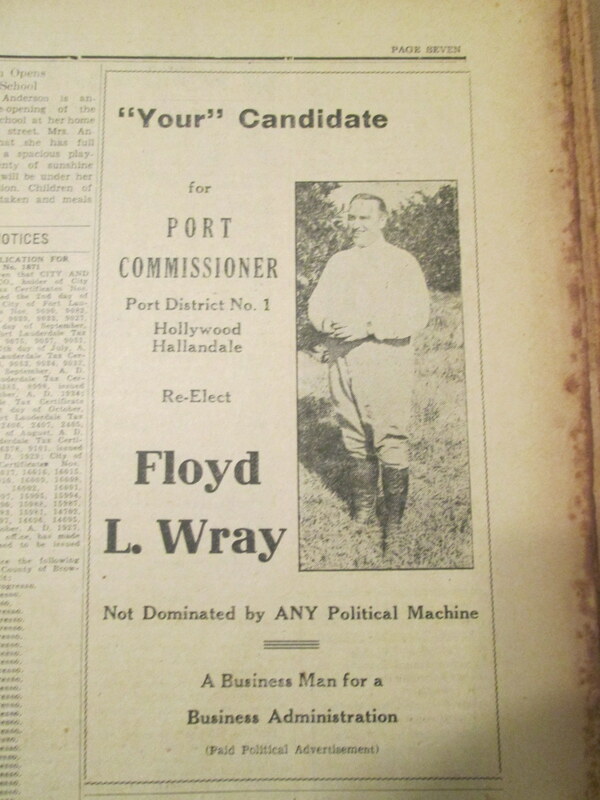 In the ad from the October, 1936 Hollywood Herald Wray is pictured in the orange groves at Flamingo Groves, when he ran for Port [Everglades] Commissioner. Dr. Kellner and his wife Charlotte lived at 1820 Rodman Street. C. R. and Grace Gilliland’s home was at 1352 Hollywood Boulevard (now gone). In the 20s he had been manager of Young’s Hollywood Boat and Transportation division. I haven’t identified Don Freeman. Orange Brook property described, May 1934. According to the Hollywood Herald of May, 1934 the property was “approximately 220 acres of land in the section of the city south of Hollywood Boulevard between the Seaboard Airline Railway tracks and Park Road.” It was “to be developed for civic park purposes,” as a municipal golf course. 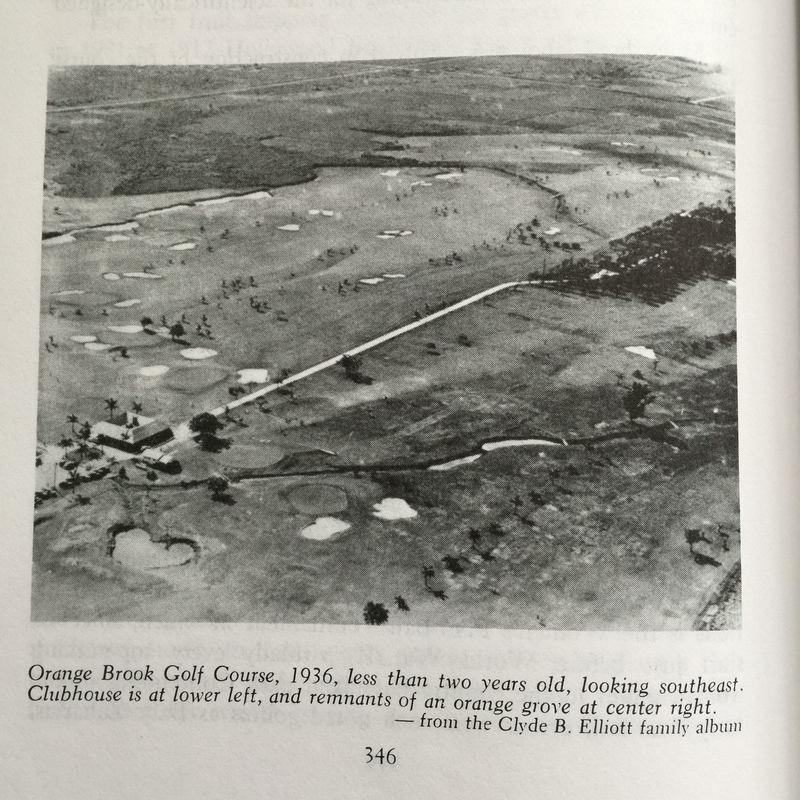 At left, page from TenEick’s History of Hollywood showing an aerial view of Orange Brook Golf Course in 1936. The clubhouse is bottom left and the grove of orange trees is upper far right. Below, detail of another aerial photo showing the same area at upper left, with the southeast quadrant of Hills Circle (Presidential Circle) at bottom right. Hollywood Boulevard runs along the photo bottom, to the original Hills Inn which by this time is Riverside Military Academy. The orange grove can be seen near center left. The road along the top is Pembroke Road, with Meekins rockpit at top right. Once again Ralph Young was asked to lay out the course—or perhaps to indicate what he had planned originally. As the land was cleared of dense palmetto growth, some of the old orange trees were found, as was the spring for the canal. Hence the name, Orange Brook. Assistance with the labor involved was also obtained from the CCC (Civilian Conservation Corps, part of FDR’s New Deal), who also built the hill and “fort” at Greynolds Park. Clubhouse by Lukens. Another link to Hollywood’s history is the clubhouse, which was designed by Hollywood architect Bayard Lukens in his signature 1930s Moderne style. At right, Orange Brook Golf Course clubhouse, south facade. Designed by architect Bayard Lukens. Ralph Young trophy. When Ralph Young, who lived with his wife Lena at 1715 Buchanan Street, died in 1938 the Orange Brook Golf and Country Club named a championship trophy in his memory. Orange Brook brought famous golfers. Among those who played there in the 1930s and 1940s, were Sam Snead, Ben Hogan, and Byron Nelson, according to TenEick. 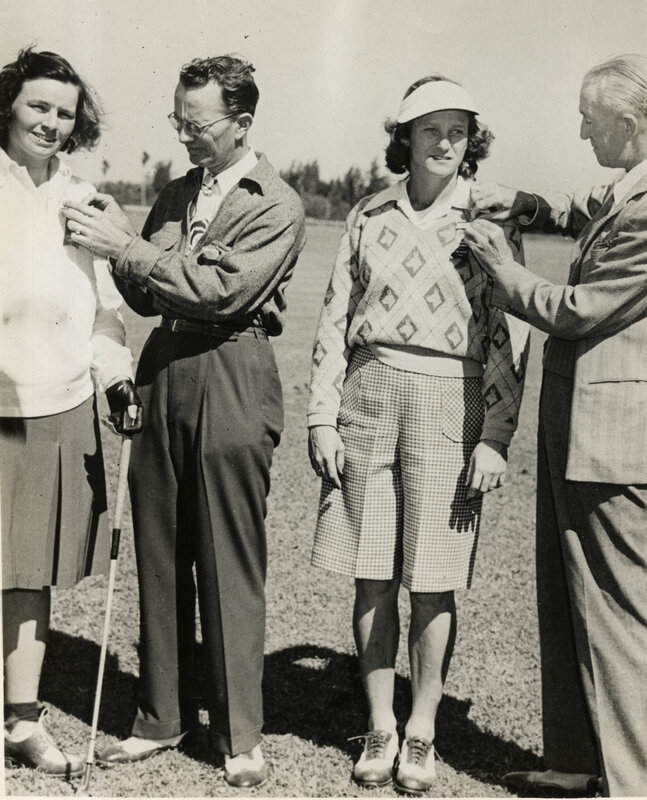 at l., Louise Suggs, unknown man, Babe Didrikson Zaharias, unknown man, n.d. The Forties brought the Women’s Four-Ball Tournament, attracting champs like Louise Suggs and the incomparable Babe Didrikson Zaharias. In the photo at left, Suggs is at left and Zaharias is in the center. 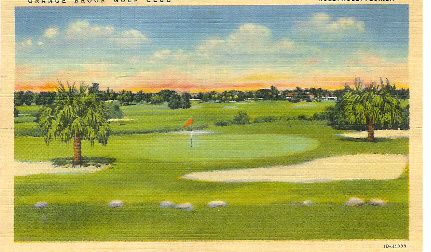 In the 1950s South Broward High School’s golf team trained there. I know, as I was on the team. SEASON’S GREETINGS AND HAPPY NEW YEAR TO ALL! I’ve been asked when J. W. Young started calling his city “Hollywood By-the-Sea.” The answer seems to be as soon as he began to publicize his new city. At the time of the first purchases of land in 1920, the available documents show Young named his city as “Hollywood,” which was property owned by the Hollywood Land & Water Company. 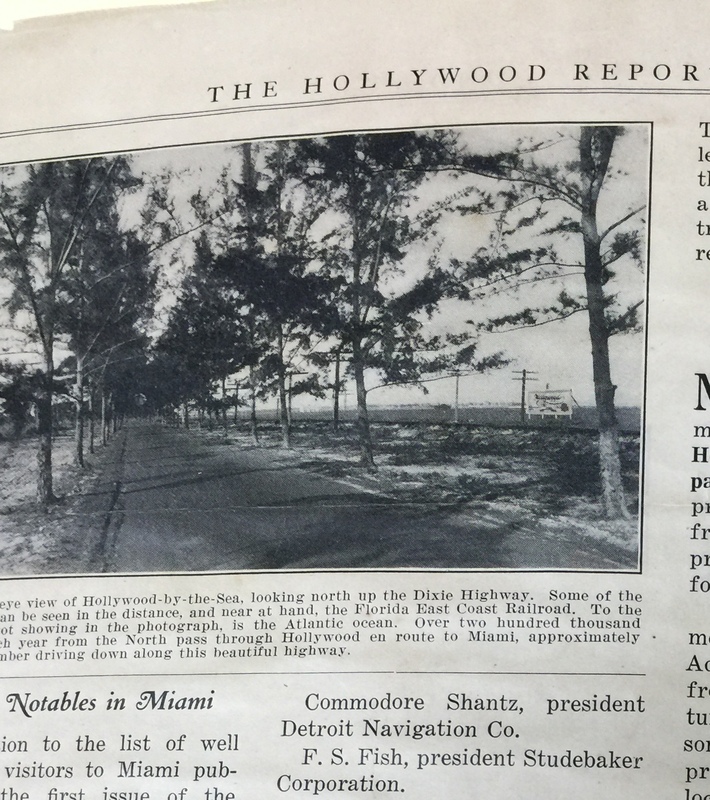 What Hollywood, FL looked like in 1920, just palmetto and pines. At that time the “city” consisted of dry scrub land on either side of the Dixie Highway/FEC railroad tracks. 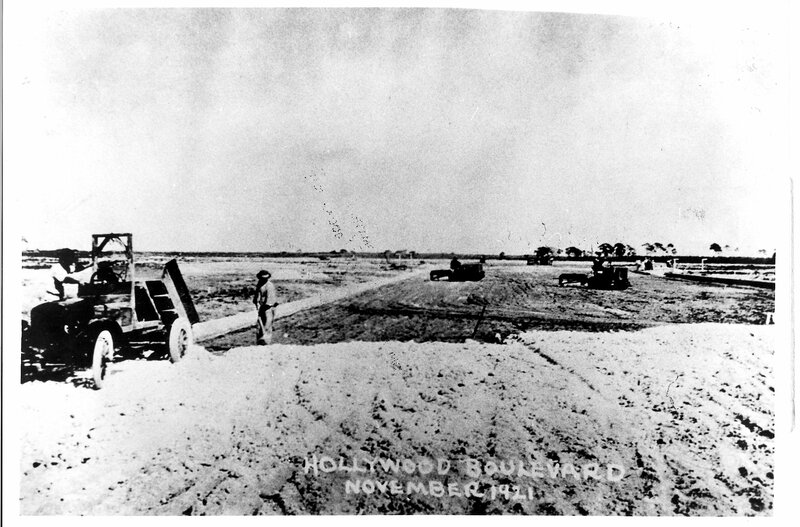 Clearing the land continued through 1920, then the first street, Hollywood Boulevard, and the first 10-acre circle were surveyed beginning in May, 1921. 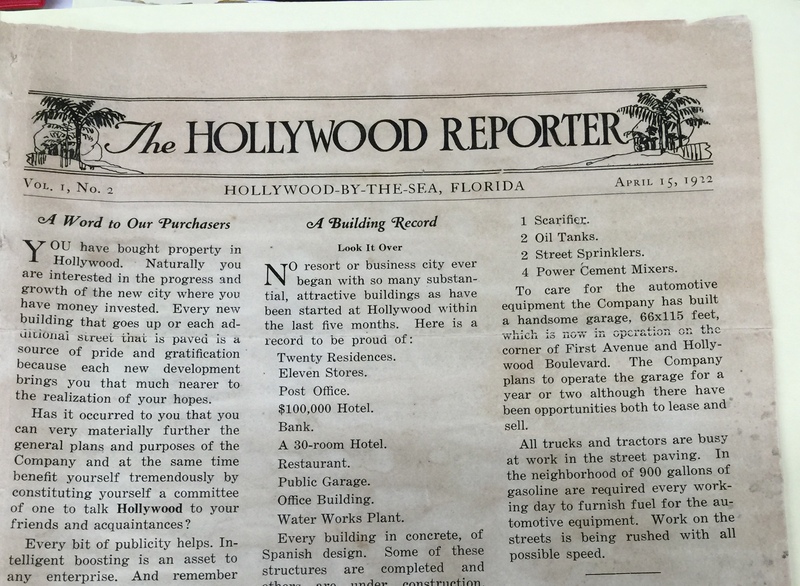 Certainly by July, 1922 Young’s company newsletter, The Hollywood Reporter, used “Hollywood by-the-Sea Florida” as its subhead. 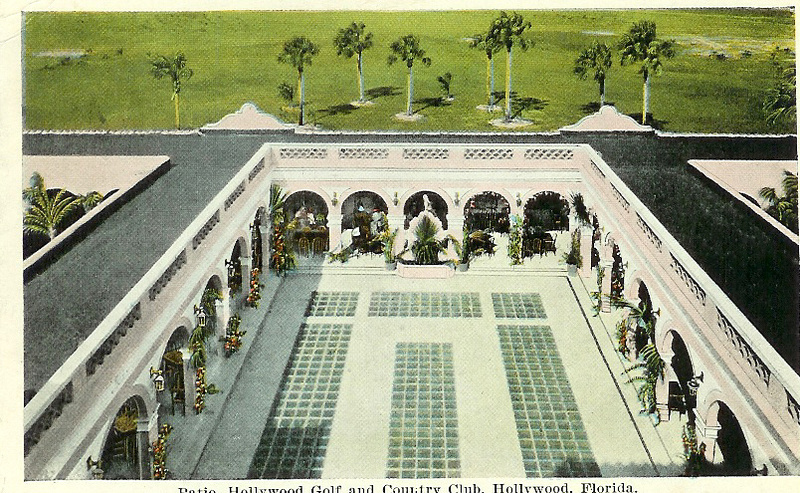 The January 15, 1923 Reporter indicates that the recently-formed Chamber was named the “Hollywood-by-the-Sea Chamber of Commerce.” Later, a 1927 brochure published by JW Young Properties Inc. used the address Hollywood-by-the-Sea, Florida, with offices in New York at 535 Fifth Avenue and in Chicago at 180 North Michigan Avenue. One possible source for this pleasing description may have been a 1920 campaign to change the name of Miami Beach to “Miami by the Sea,” according to the Miami Metropolitan Herald of November 19th. The nearby development of Fulford-by-the-sea came along after Hollywood had been well-publicized (and it wasn’t by the sea). Perhaps both of these sobriquets were inspired by the popular song, “By the sea, by the sea, by the beautiful sea….” published in 1914 (and later sung to me by my grandmother). Young’s Hollywood wasn’t precisely by the sea initially, but he surely chose the property with an eye on the barrier island just to the east of his land, and very shortly he began to purchase parts of that island, beginning with the section that today is from Johnson to Washington Streets. Next he added sections to the north as far as Sheridan Street, and eventually J. W. Young’s companies owned the entire barrier island from its north tip south, only excluding Hallandale. Beginning in 1924, residents began writing songs about their city, and all of the songs refer to “Hollywood By-the-Sea.” The first song with that title was by Phil Vitsky, who had been a song-and-dance man in vaudeville before coming to Hollywood to run the Western Union telegraph office. According to Virginia TenEick, Vitsky’s “Hollywood By-the-Sea” was widely played by dance bands and radio stations around the nation. Just imagine, people around the US singing about Hollywood By-the-Sea since 1924! Of course, Hollywood, Florida isn’t just a beach, it’s an entire city. To my knowledge, none of the other 16 or so Hollywoods in the USA is on the shore, so our Hollywood surely could claim the distinction of being “Hollywood By-the-Sea”! HOLLYWOOD, FLORIDA BEFORE INCORPORATION IN NOVEMBER, 1925. Now I’ll return to the monthly format, which in this blog will include events in both October and November. November 1-11, 1920. Having bought the land, Young was eager to begin developing his future city. 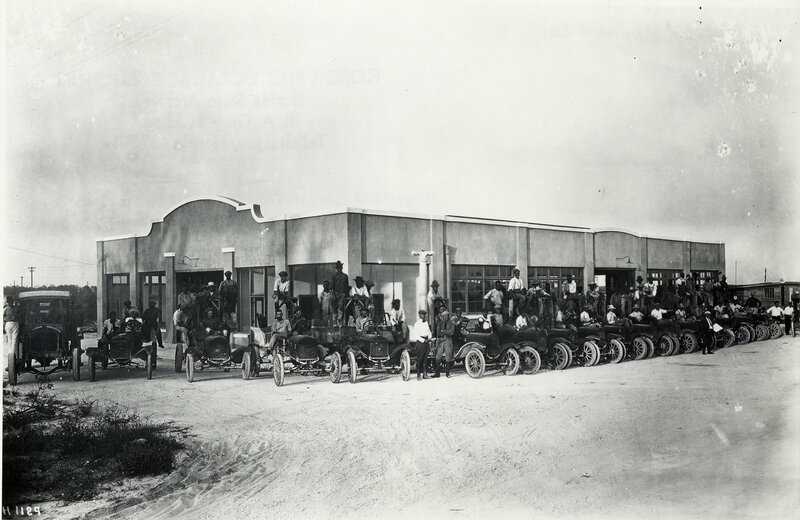 As his business at that time was in Indianapolis, Young needed people on hand in Florida, so he sent twelve salesmen and engineers to drive down Carl Fisher’s Dixie Highway to get the ball rolling. Two of these were salesman C. W. Sammons and my father, 25-year-old World War One Navy veteran, A. C. Tony Mickelson. The drive from Indianapolis to Miami down the young Dixie Highway—it was completed only in 1915—took eleven days. Most of the next year involved clearing the land of palmetto scrub. November, 1920. Warren G. Harding is elected US president. This involves Hollywood as he would visit the city in 1923. November 19, 1921. 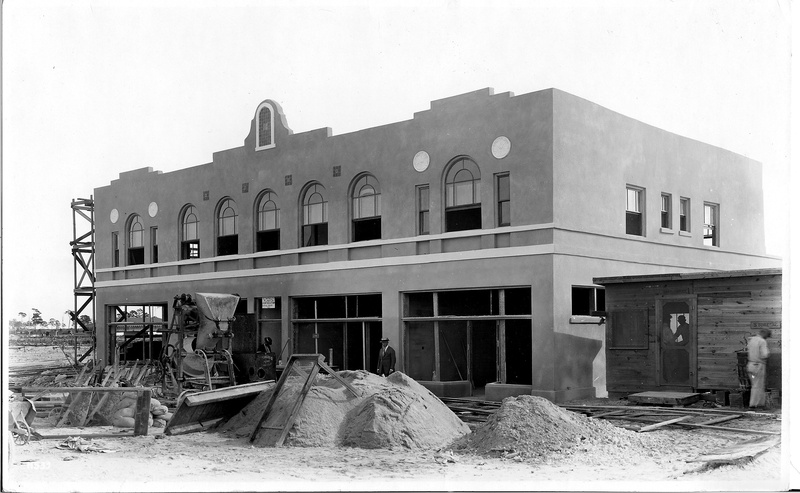 According to Virginia TenEick in her History of Hollywood, the Young company’s first sales pavilion was opened on the southwest corner that would become Harrison Street and 19th Avenue. At right, cars and people surround a large tent that was Hollywood Land & Water Company’s first (of three) sales pavilions. 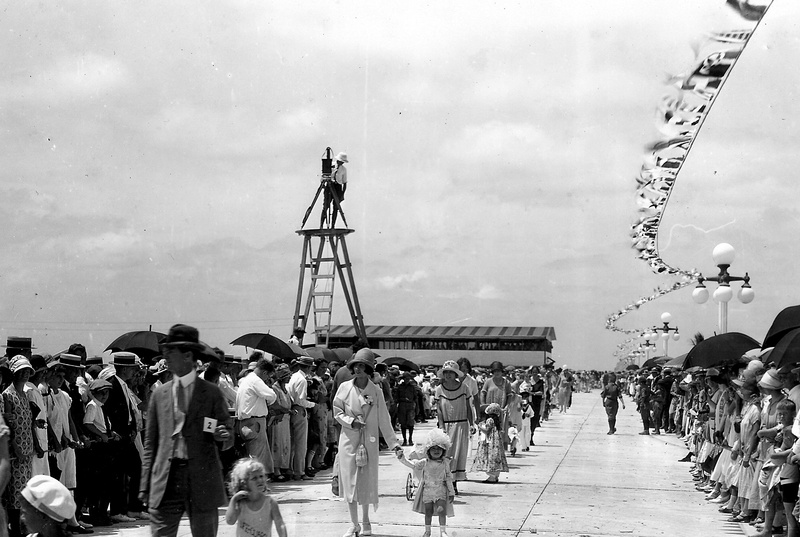 These crowds arrived in the new little city by driving from Miami or from as far north as Palm Beach along the Dixie Highway. The tent seated 350 on built-in benches. Young also brought prospective buyers to his city by bus. All who came were served lunch consisting of an apple, a sandwich, piece of pie, and coffee. Then came the sales pitch couched as a lecture on the beauty and advantages of living in south Florida. Buyers were many and eager. Late 1921. The first permanent building was erected in Hollywood was completed. 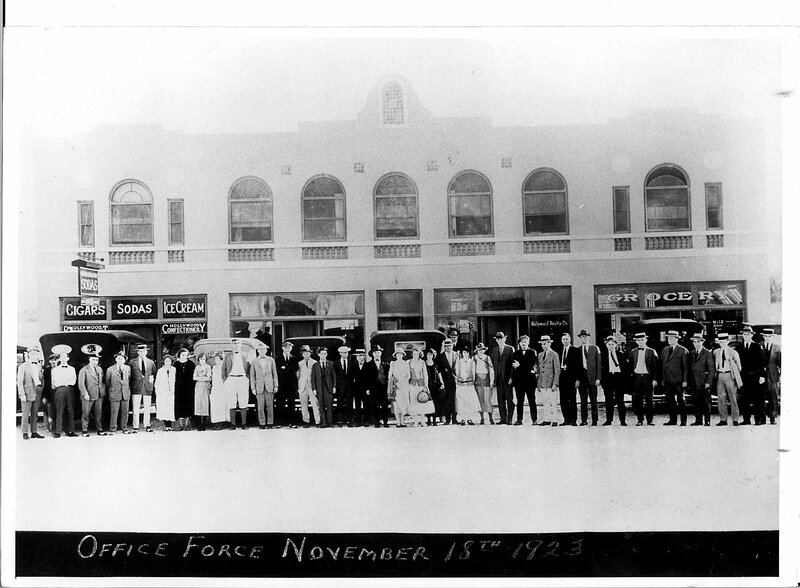 This was the company garage, built at the city’s first street corner, 21st Avenue and Hollywood Boulevard. Right, Hollywood’s first permanent building, initially a maintenance garage, stands on the northwest corner of 21st Avenue and Hollywood Boulevard. The photo here would have been taken from the FEC railroad tracks. 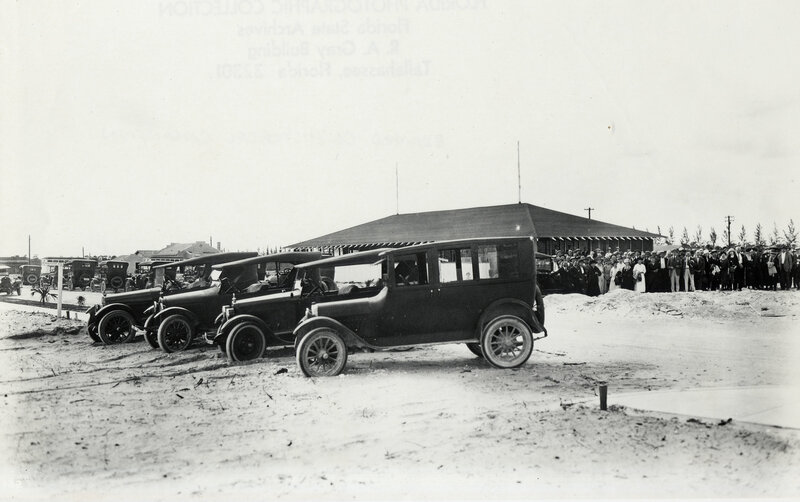 Displayed here are a dozen or so of Young’s working trucks, neatly lined up, driven by a group of the black workers who built Hollywood. Photo dated October 25, 1922. Two points here: one is to note that April , 1922 was the second issue of the Hollywood Reporter. Therefore, there was a first issue, from earlier in 1922. But no copy of this first issue, V. 1, no. 1, has yet been found. Also, I hope these photos are getting across the fact that Hollywood was begun as part of the age of the automobile. I have yet to find any reference to horses in the earliest material on the city. Young’s company owned cars, buses, trucks, steam shovels, dredges, even boats–but no horses. Left: Hollywood Boulevard in 1921. Some of Young’s trucks, tractors, and rollers at work building the city’s roads. Below right: two of the Company’s steam shovels excavating oolite limestone that was used to surface the roads. Photo gift to Hollywood Historical Society by Ralph Thompson. The first impression of newcomers to the city in the early Twenties was its bright, daytime glare. Houses were constructed with space for autos, not stables for horses. That was the past, and Hollywood was very much part of the Roaring Twenties, the FUTURE. If you are watching “Miss Fisher’s Mysteries” you might get a sense of life (on a less grand scale) in Hollywood in the Twenties. Two other buildings were begun about the same time as the garage. These were the Hollywood Land & Water Company’s first administration building, and its neighbor, a group of stores. 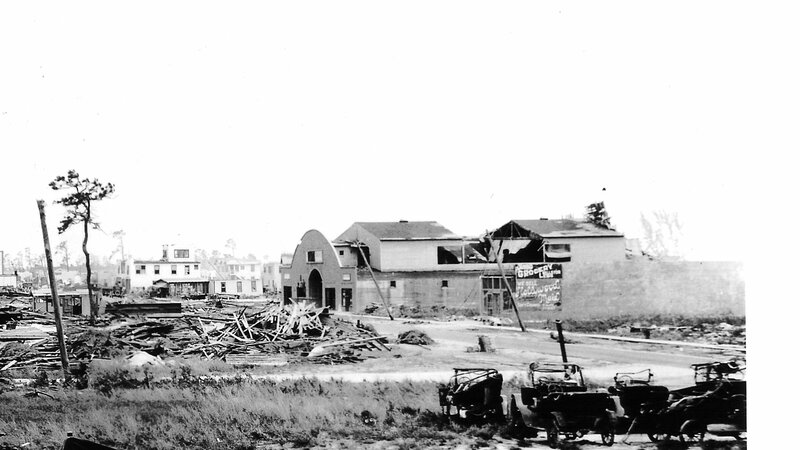 At right, the first Administration Building under construction in 1922, on the southwest corner of Hollywood Boulevard and 20th Avenue. Originally the offices were on the 2nd floor with shops below. The 2nd floor was removed in the 1920s. Today this is Morningstar’s. At left, the Bastian Building, also 1922, and like the Admin Building designed by Rubush & Hunter. Below, both buildings. 20th Avenue runs between them, as it does today. A sign for “Sodas” is on the east corner of the Admin building, while Black’s Drugs are advertised on the Bastian Building. Black’s was Hollywood’s first drug store, followed on this same corner by Yaguda’s and then Iris Drugs. In October, 1923, the Hollywood Reporter announced that “finishing touches” were being added to the new golf course. 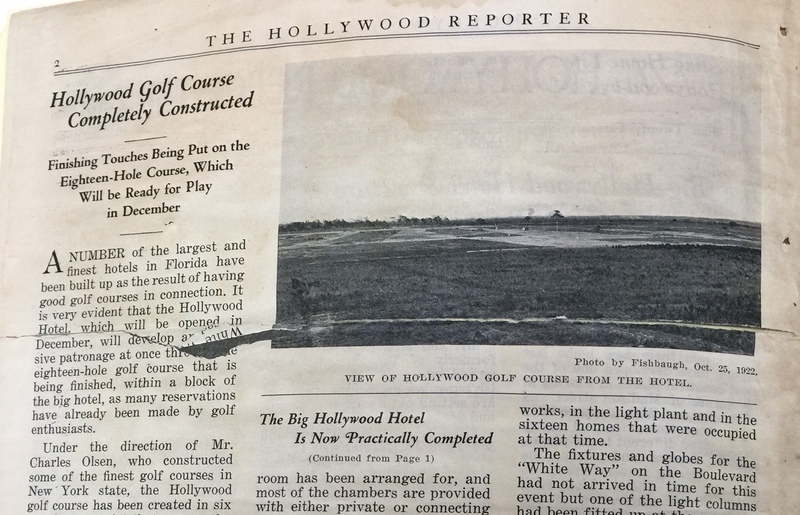 At that time, there was really not much to see, but the Reporter wanted readers (hence, buyers) to know that Hollywood had an 18-hole golf course just a few blocks from downtown. Also in October, 1923, the Hollywood Land & Water Company was proud to announce that the all-black city of Liberia was formally opened. I’ve described Liberia extensively in previous blogs, and will note here that the Reporter states that it was developed with water and electricity, land for schools and churches (donated by Young as he did in Hollywood), and now had four homes built and ready for occupancy. 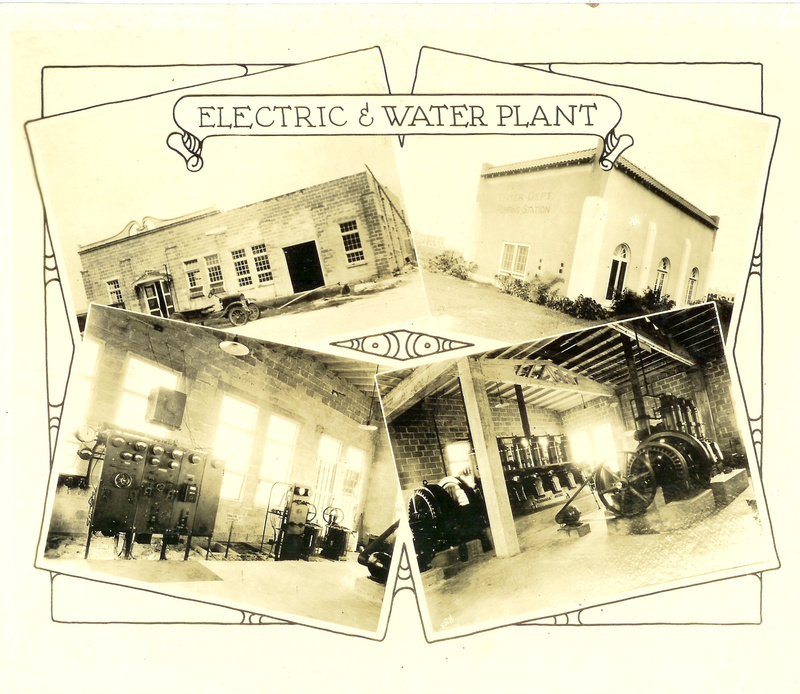 Speaking of electricity, please note that from its earliest days, Hollywood was wired for electricity, with lines underground downtown, and in the alleys in residential sections. 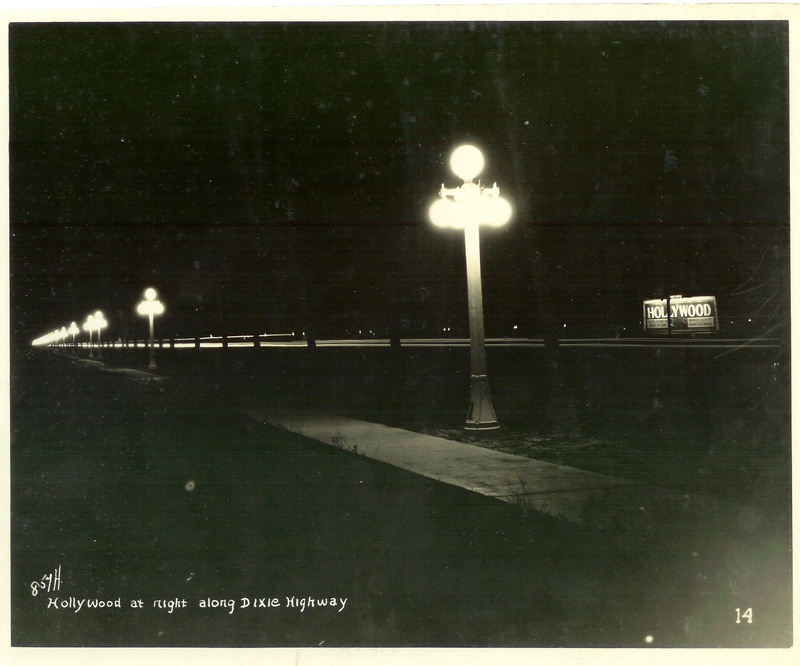 The Company planned to install street light fixtures all up and down the Boulevard and around the Circle, which would be called the “White Way,” according to the 1922 Reporter. At some point handsome street lights also lined the Dixie Highway from Dania to Hollywood’s south border. 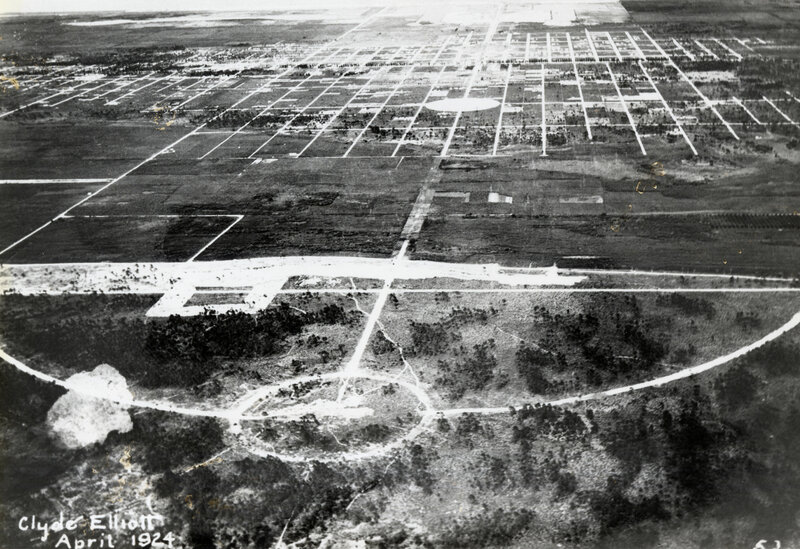 As both surrounding towns, Dania and Hallandale, had large amounts of acreage given over to farming (and not requiring illumination), Hollywood all lit up must have stood out like a space ship landing. 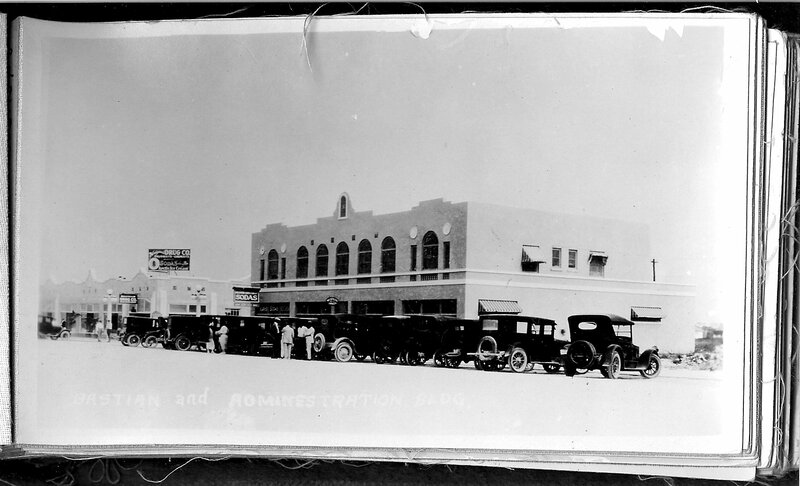 In November, 1922 the second sales pavilion was erected, a large, open, 2-story frame structure on Hollywood Boulevard at 16th Avenue. This was about as far east as Young could go on the Boulevard at that time while the Lakes Section was still under creation. The top story gave visitors a view of the beach and ocean. Also in November, 1922 the future Park View Hotel was under construction, Young’s first hotel, designed by Rubush & Hunter. 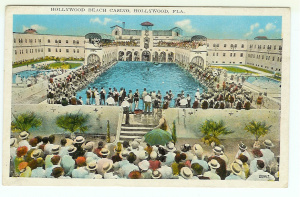 Originally it was called the Hollywood Hotel, until the hotel on the beach was built, Hollywood Beach Hotel. To prevent confusion, this was changed to the Park View Hotel as it overlooked Circle Park. 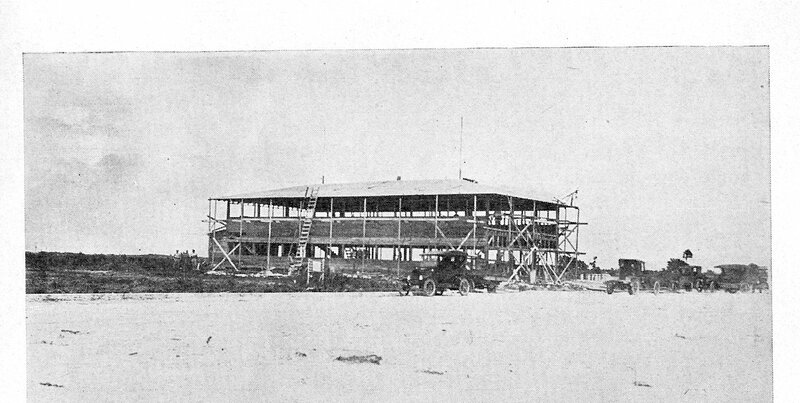 In the photo at the bottom of the Reporter page of November 15, 1922, at left, the nearly-completed hotel is described as “Gracefully elongated. Facing the Circle the design is Spanish Renaissance, while toward the sea Moorish effects will add an artistic touch.” Not visible in the photo of the west facade, the “Moorish effect” is represented by a gold dome off-center to the north. City is incorporated November, 28, 1925. From empty scrub land in 1920, J. W. Young had created a thriving city and was ready to hand its management over to others. The city of Hollywood was formally incorporated in November, 1925, then needed officials to run it so the first officials were appointed by the committee that had drawn up the city charter. These commissioners were Joseph W. Young, Jr., his son John “Jack” Young, Ralph Young (no relation), Paul R. John, and David Fessler. This group immediately voted for J. W. Young to be Hollywood’s first mayor. To celebrate the 90th anniversary of Hollywood’s incorporation, a walking tour of the historic Downtown was held November 1, 2015, with visitors guided along the tour by an illustrated descriptive booklet, prepared by the Hollywood Historical Society with support from the city. I wrote the text, images were lent by the Hollywood Historical Society and HistoryMiami, and Gabriela Milner designed the handsome booklet.